I want to talk today about the Green New Deal and how those of us in the green transportation community can contribute to filling in the policy details in our field. The Green New Deal has stimulated lots of discussion, although perhaps there has been more heat than light in much of that discussion. As I have said previously (here) I support the concept of the Green New Deal, believing that it provides an excellent framework for formulating the work that needs to be done to guide our nation through the dangers of this century while improving the lives of our citizens and advancing our values. 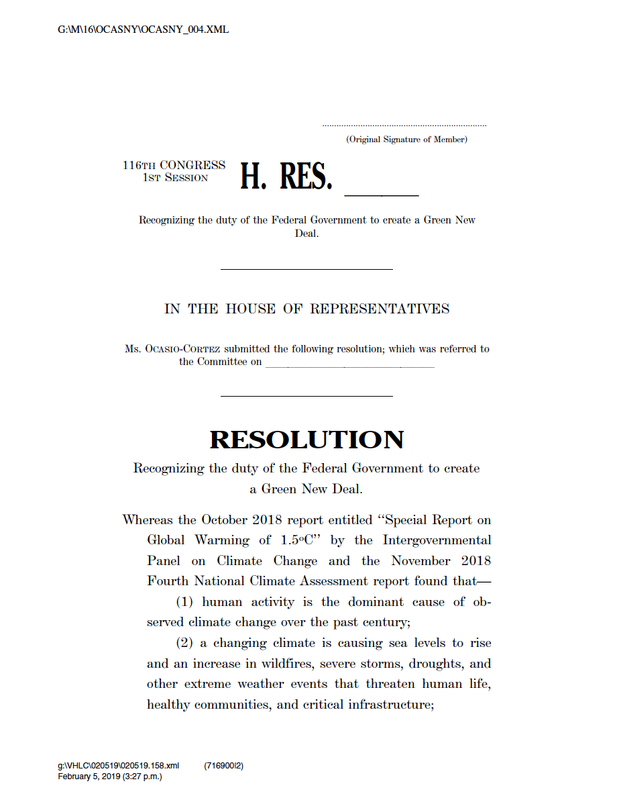 Right now, the Green New Deal is a name, a congressional resolution setting out broad goals and objectives, and a miscellaneous set of documents. Supporters of the Green New Deal recognize that it is a unifying concept, not a program, that now needs detailed policy work in a dozen fields. It’s time for those of us in the transportation policy space to begin that work for transportation. “overhauling transportation systems in the United States to eliminate pollution and greenhouse gas emissions from the transportation sector as much as is technologically feasible, including through investment in – (i) zero-emission vehicle infrastructure and manufacturing; (ii) clean, affordable, and accessible public transportation; and (iii) high-speed rail.” This goal – which I think can be restated as “decarbonize the transportation sector” – will require thinking about a variety of issues, including some not mentioned or implied by the language of the resolution and related documents. So let me do a quick review of some of those issues to – hopefully – help advance the discussion. As I am presenting a generally “can do” assessment I will from time to time refer to the “no can do” arguments, which I think are best articulated by Eric Adams in his article in The Drive entitled “Here’s Why the Green New Deal’s Bold Transportation Ideas Are All But Impossible to Pull Off” (available here). The Green New Deal resolution doesn’t actually set a target for electrifying the passenger fleet but it specifically calls for investment in EV manufacturing and infrastructure. And it is clearly a key element in getting to a “zero net GHG emission” state by 2050. This goal is nothing new and many of us have been working on it for several years. Can we get to a completely decarbonized passenger fleet in the next 30 years? Adams (my “no can do” advisor) is skeptical, citing a report that estimates that only 14 percent – at best – of passenger vehicles on the road will be electric by 2030. And, he adds, assuming we can ramp up the manufacture and sale of EVs, how do you turn over the huge existing fleet? In my view, although the task of electrifying the passenger fleet is big, it isn’t particularly complicated. We pretty much know how to do everything that needs to be done. It’s largely a matter of scaling up. What are some of the ways ahead? · Carbon pricing – Many states are exploring “carbon cap and invest” and similar techniques for making fossil fuels more expensive and using the revenue gained to advance clean energy. · “Cash for Carbon Clunkers” – Adams suggests this (perhaps sarcastically?) but it worked in the Stimulus program and it can be easily scaled up to deplete the old inventory of internal combustion vehicles. Other issues? Yes, environmental justice (poor people drive clunkers for a reason), transitional hardships, urban/rural equity, etc. More work to do! Electric vehicles need charging. Although most EV owners charge their vehicles at home and battery range is improving rapidly, many people in the field believe that an extensive public charging network is needed (this includes me, but by no means everyone in the field – still a debated issue). My view is that providing an extensive network of publicly accessible rapid chargers, especially on the Interstate and National Highway System networks, will enable easy intercity travel by EV owners, assuage “range anxiety” by potential buyers, and demonstrate a solid government commitment to making EVs work. Adams (no can do) cites a report which estimates that a vast number of chargers (both home and public) will be needed and that “some sort of magic” may be required to make that happen. I am unpersuaded. I can cite another report (link here), which estimates that a relatively small number of strategically placed charge points can make a national travel network possible. I believe that a vigorous national program to build a rapid charger network, perhaps spurred by making FHWA funds available at a 100% rate, can put that network in place fairly rapidly. That strategic network, combined with the development of a smart electric grid, faster charging technology (for instance, see here), more and better home storage batteries, and improved car batteries, can solve the charging problem. · Funding – The answer for a funding shortfall is……..more funding! Significant funding is needed at the federal, state, and local, both for capital and operating. · Ridership diversions – Some people believe that the rise of transportation delivery companies (Uber, etc.) spells the end of mass transit. I side with the Jarrett Walker position that the actual geometry of cities (density) means that they won’t work well without the means to move large numbers of people efficiently along corridors, in other words, transit. Transit systems, of course, need to deliver faster, more convenient services to fill their role successfully. · Cost of expansions – We need to make a lot more money available for transit expansions while at the same time dramatically improving project delivery and cost control. More rapid transit lines in separated rights-of-way are absolutely needed to make cities thrive. A prime example is the city of Baltimore, where the proposed Red Line light rail line would provide major leverage toward revitalization of that troubled city. Killing that project (as has been done, at least for the moment) may have condemned it to decades of failure. · More buses – Comparatively, buses are cheap. When run with upgraded service, as Bus Rapid Transit, they can outperform private autos and approach light rail speed and service and can be good candidates for automatic operation. · Electric buses – What can be done right now? Flood the country with electric buses! These are just now approaching market competitiveness and are ripe for robust government subsidies (see my posting on the topic here). OK, this is a tough one. In the heyday of high-speed rail planning, following the Obama Stimulus, several projects looked promising in the near term. Now, with California HSR imploding, no project looks promising. Upgrading the Northeast Corridor, if not yet to full HSR standards, should definitely be in the top tier of a Green New Deal transportation program. At the national level, the future is murkier. If willing candidates are found, perhaps some of the 2009 initiatives can be relaunched (I’m talking to you, Wisconsin). Beyond that, I think there will be some years of planning before there is anything like a national program. Delivery trucks: Electric power beginning to work here. Long-haul trucks: New electric rigs debuting (my comments here). This subject has attracted lots of attention in Green New Deal talk – although it’s not even mentioned in the resolution! Some of the associated documents have mentioned the high GHG emissions associated with air travel and suggested that high-speed rail could replace some or all of that travel demand. I talked a bit about the problems with HSR above. The U.S. is a very big country, and while you can make a strong case for rail replacing a lot of air travel in 300-mile-long corridors, it’s hard to see that working for 3,000-mile trips. I’m afraid we’re going to have to look to new technology to help us out here. · Fix it first—A lot of money needs to be spent on bringing elements of our legacy systems to a state of good repair. This work doesn’t always advance the Climate Change fight, but it needs to be done. Funding generated for the Green New Deal must not draw resources away from these bread-and-better needs. 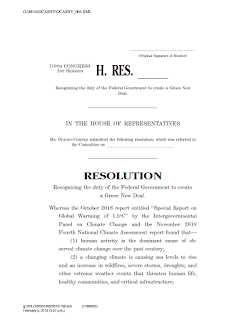 · Resiliency—The Green New Deal for transportation should include goals and strategies for making the system more resilient to Climate Change and the associated extreme weather events. This subject doesn’t seem to have attracted much discussion, but it is vitally important. The work that needs to be done under this heading includes hardening of facilities, elevating roads and bridges, and building redundant facilities. · Materials—More work needs to be done in the research and development of materials (concrete, asphalt, etc.) with reduced GHG impacts during their production and application. I’m looking forward to seeing more “smart” materials! I want to give just a few final thoughts on how and why the Green New Deal can be accomplished. Perhaps the best argument I have seen for the Green New Deal – and certainly the best defense against the barrage of opposition – is the recent piece by David Roberts on Vox (available here). The title says it all: “This is an emergency, damn it: Green New Deal critics are missing the bigger picture.” Roberts’ central point is that the Green New Deal represents the “courage and fresh thinking” we need to address the Climate Change crisis on an urgent basis. The various critics “seem oblivious to the historical moment, like thespians acting out an old, familiar play even as the theater goes up in flames around them.” He believes that the political energy generated by supporters of the Green New Deal may be the only way to jolt the U.S. political system into taking the actions needed. I certainly agree with the need for a sense of urgency, and I suggest that we remember the real success that was achieved under the Obama Stimulus Plan. I believe that if we had sustained that level and overall shape of a transportation program on an annual level, much of what we are seeking to do would already have been achieved. Although “one off” and thrown together in a hurry, the Stimulus demonstrated that a high level of funding – especially when tied to high aspirations – can produce great results. Finally, if this work is as necessary and urgent as many of us believe it is, we just really need to figure out how to do it. 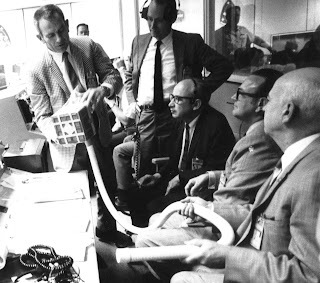 My favorite analogy is the famous CO2 scrubber scene in the Apollo 13 movie (which actually happened), in which engineers had to figure out how to solve a problem using only what materials and techniques that they had at hand. Let’s do it. Congrats to the movers and shakers of Bethlehem for winning the 2018 “Commonwealth Awards” for Smart Growth development in Pennsylvania. The Awards, given out annually by 10,000 Friends of Pennsylvania (full disclosure: they have been a client of mine), showcase the best development in the state. Some keys to their success: casino money (Sands) carefully targeted for redevelopment, a transformative mayor (John Callahan, one of the honorees), active colleges (Lehigh, Moravian), supportive business and civic groups. As Callahan pointed out, there was no guarantee of success and many cities with similar challenges have failed to overcome then. The old Bethlehem Steel brownfield site is now home to the Artsquest Center (website here), the Christkindlmarkt Christmas market, concerts, and more. 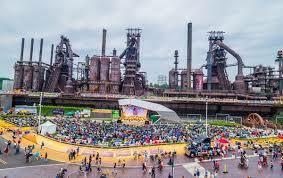 The impressive old Bethlehem blast furnace complex (“SteelStacks”) has been kept as a monument to the past and a focal point for the future. · Five10Flats - Another new apartment complex on the Southside, this one offering “upscale urban living,” complete with a Starbucks, fitness center, rooftop terrace, and an indoor dog wash (here). 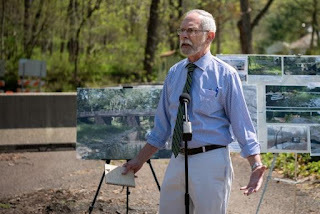 · South Bethlehem Greenway – A rails-to-trails multi-use greenway connecting many of the Southside activity centers (here). Congrats to the civic leaders of Bethlehem for their efforts and congrats also to 10,000 Friends for their continued leadership for Smart Growth in Pennsylvania. Méi gutt Noriicht (more good news) from Luxembourg! 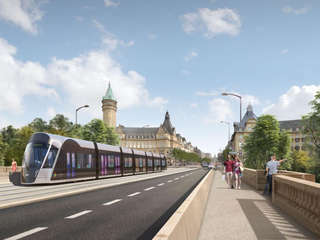 About 11 months ago I wrote about Luxembourg’s cool new tram system (here). Now an even better story from that small but impressive country: they are going to try no-fare public transportation (story here). Will it work? Hard to say. But it’s delightful to see a bold experiment in transitioning to an environmentally friendly 21st-century transportation system. Especially as in the US we are boldly moving toward the 19th century! People outside the transportation agency world often think that bike-ped projects (sidewalks, bikeways, bike lanes, etc.) should be quick and easy to design and build. But it ain’t necessarily so. These projects often have problems and issues just like other, larger projects, including competition for funding, lack of expertise, controversy within agencies, controversy with the local community, and – wait for it – challenges from environmental agencies. There are ways of speeding up these projects, and I’m happy to have been part of a great team that has put together a workbook filled with tips for doing just that. 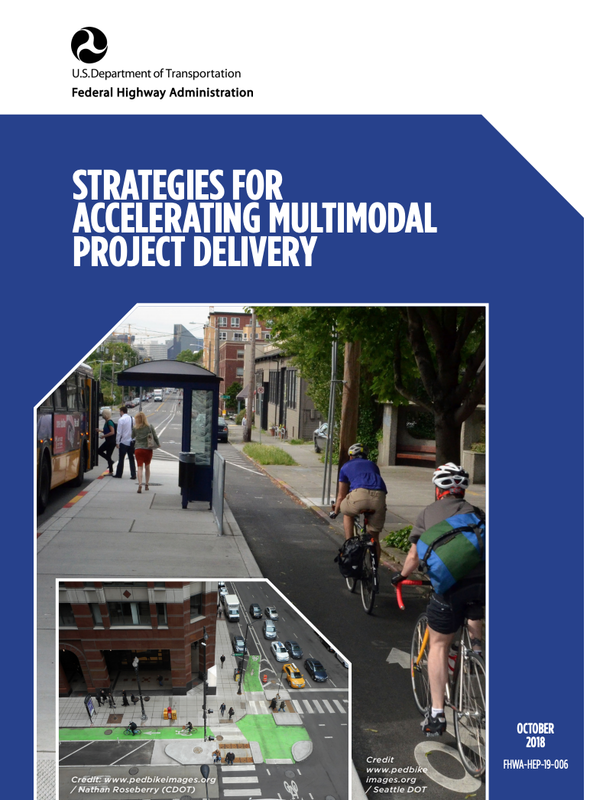 Sponsored by FHWA, the workbook is entitled “Strategies for Accelerating Multimodal Project Delivery” and is available here. Also available on that webpage are a related slideshow and access to a webinar (including my dulcet tones). The document is based not only on the pooled expertise of the authors but also on extensive conversations with many practitioners, who shared their experience with us. All this information has been distilled into easy-to-use text, with case studies and links to other sources. If you are involved in any step in the project development pipeline for bike-ped projects, I think you will find this workbook very useful. A few weeks ago I commented on the new hydrogen fuel cell train now in revenue service on a commuter line in Germany (here). This promises to be transformative technology and bears following. 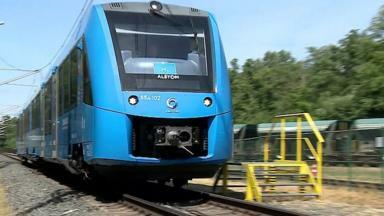 The BBC has now done a story (here) which gives another (video) look at the new train.